I mentioned in my last DvL post that I had decided to level my "event agent" through the class story. After finishing that particular endeavour, I thought it deserved a post of its own. First off, the levelling experiment: As I mentioned in the previous post, I ended up using this character as an experiment to see how far I could get doing just the class story and nothing else / at which point my level would fall far enough behind that I couldn't continue as before. The answer? It never happened. I dinged 50 while wrapping up the last couple of companion conversations after completing my final mission. I'm still astounded by that. Yes, I did get some exploration XP and I was also rested a lot of the time, but still... basically, it seems to be really hard now to be underlevelled for your class story. 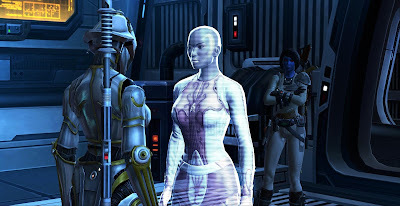 Also, it really showed that I hadn't done the agent story in a long time because from Hoth onwards (which is how far I'd got my Cathar agent last year), I ran into a lot of things that I barely remembered. There will be some spoilers for chapters two and three of the agent story here. On Hoth, where you interact with the Chiss, I was pleasantly surprised by all the lines that took into account that my agent was a Chiss too. 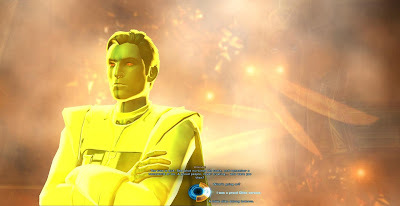 I shamelessly flirted with Aristocra Saganu, the Chiss leader, and he was so pleased with me that he actually adopted me into his noble house by the end. 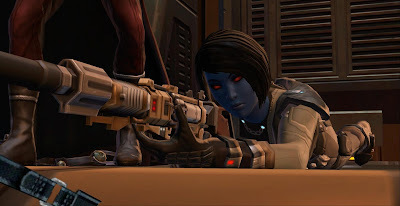 I think if Bioware had any specific species/class combinations in mind while creating the class stories, then Chiss agent was definitely one of them. There was another species-specific reference like that on Voss, when I was asked about my past at the Shrine of Healing. Revisiting the agent story on Voss was nice in general because while the part with Bas-Ton and his family had been very memorable, I also have this vague recollection that everything else kind of confused me during my first playthrough. Maybe it was because I had taken a break for too long at the time, maybe I got distracted by side quests, but I do recall not quite being able to make heads or tails of what the Shining Man had to do with anything. This time around it was all much clearer. Corellia just reminded me of why I dislike that planet: Aside from the war-torn environment being kind of depressing, the maps are confusing and you constantly end up being lured into dead ends. There was one point where it took me something like fifteen minutes to find the right way to access one of my quest objectives... and I've been playing this game for nearly five years. FFS, Corellia. Getting to redo all the companion stories was pretty fascinating as well. I remember absolutely loathing Kaliyo after that last mission on Hutta on my first agent, and if I'd had the option I would have shot here right then and there. Yet somehow, this time it didn't seem nearly as bad. I'm not sure if that's because I knew what to expect, different conversation choices made it sound like less of a big deal, or a bit of both, but I could actually see my character tolerating Kaliyo's continued presence despite of not liking her very much. Vector is still my favourite romanceable companion in the game; he's just too adorable. I married him this time. Scorpio freaked me out a bit because I had completely forgotten about the part where she tries out a holographic human form for a bit. In general, there were some interesting interactions between the different companions as well, such as Vector and Doctor Lokin developing a sort of friendship, Lokin spying on Kaliyo, Vector trying to understand Scorpio and more, which was quite fascinating considering what a varied bunch the agent companions are. Finally, let's talk about what was the actual impetus for levelling this character through the class story: wanting to see a different ending, specifically the one where you agree to be a double agent for the Republic. Vrykerion mentioned in his chapter two review that he had never managed to get it in several playthroughs, though a commenter chimed in to say that it wasn't hard to get, you just weren't allowed to do anything that would majorly incline Ardun Kothe against you, such as get one of his team members killed. I actually knew very little about how it would all play out. I just knew that there was a confrontation with Ardun Kothe on Quesh, but even though I let him live there, he just ran away and didn't seem to be any more positively inclined towards me than before. I got worried that I had messed up somehow and googled a video of the actual defection scene... which ended up starting on Corellia (I didn't watch any further than that once I realised this). Someone in the video's comments was complaining that he had made all the same choices as in the video but still hadn't been asked to join the SIS in the end, and eventually seemed to trace it back to a conversation on Quesh where he hadn't offered assistance to Saber and Wheels - which I hadn't done either. Argh! I felt kind of gloomy after that, certain that I had already messed up my chances of getting the ending that I wanted without even knowing it and cursing Bioware for apparently tying it to what seemed like such a minor choice. If only this was a single player game and I could reload an earlier save... however, there was a happy ending after all, because when I came to the crucial junction at the very end, Ardun Kothe did offer me a job and I was able to accept it. I don't know why it didn't work for that guy in the YouTube comments, but it must have been due to something else. Now I actually really want to get back to my Cathar agent (who is a bit evil and sided with Jaedus) to see how things play out for her. I'll put it on my to-do list for whenever I'm done with the DvL event. I actually just completed an agent for the DvL event as well (my second agent overall) and was genuinely surprised at how well the story still grabbed me. I found myself actually eager to login and play the character just to see what would happen next. 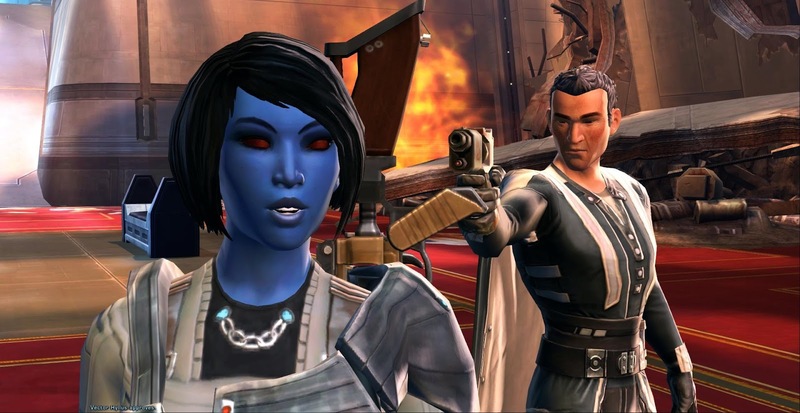 And I love the little snippets that we see of the other class stories that play into the agent storyline - like how when you're on Corellia, you hear Keeper mention something about how Thanaton and Darth Baras are engaged in politics and infighting (with the Sith Warrior and Inquisitor). Admittedly, I played my first agent over 4 years ago now, so I didn't remember a lot of those details, but it was still awesome to experience again. I think it's so cool that it's even possible to defect to the Republic in the agent story! It's one of the few story roads that is still on my wishlist. I've only done the whole agent story once, and that was on my purely evil Chiss, who sided with the sith. I'm curious about the third option, too.